Added January 2010: 1977 models, with all switched ignition circuits powered by the ignition relay. Not shown in Advance Autowire on-line version or Haynes, their 'late UK market' diagram is for 1978 and later. 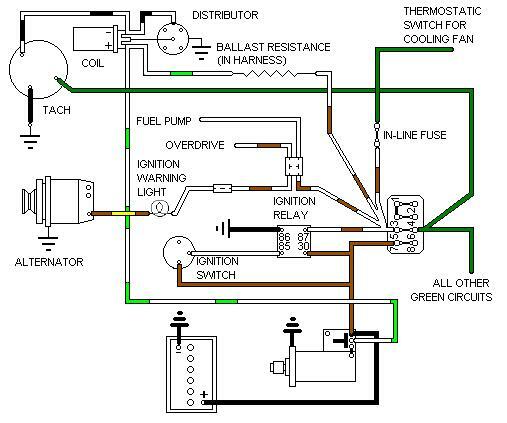 Note 1: There are two separate green circuits - the original circuit fed from the 2nd fuse up in the 4-way block for all the original green circuits, and another fed by an in-line fuse from the white/brown circuit on the relay output for the cooling fan. This fuse is located below the fusebox, probably with the hazard flasher fuse which has brown wires both sides. Note 2: There are three separate white circuits - one from the ignition switch feeding the ignition relay, another in the rear harness feeding the fuel pump, and the third in the dashboard sub-harness feeding the ignition warning light. These last two are taken off the white/brown circuit from the relay output.